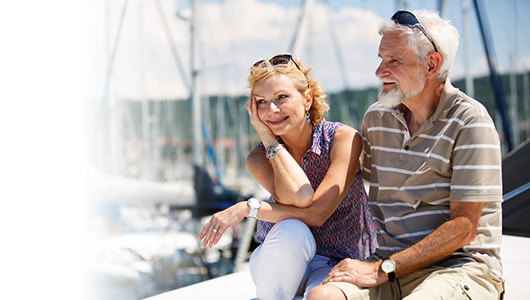 Find out how you can travel with peace of mind as a pensioner. Age shouldn’t be a barrier to adventure. At least, that’s what we believe. We specialise in providing quality, affordable travel insurance to those who’ve still got the travel bug in their silver years. Does that sound like you? With a tailored policy, you get to choose holiday insurance cover that matches your medical and non-medical needs. And there’s no upper age limit on both our Single and Annual Multi-Trip policies. It’s always good to know that you have everything covered should things go wrong when you are away. With us you can be confident you’re be buying from the UK’s Most Trusted Travel Insurance Provider*. You can get a tailored quote for senior travel insurance online here in minutes, or talk to us now on 0800 033 4902. Did you know, 1 in 20 people have to claim on their insurance**? Unfortunately, it’s more common than you might think. Unwanted costs may include bills for medical treatment and hospital stays, or even bringing you back home if you become ill. They can also include replacing lost or stolen baggage or passports. Or you might have to cancel your holiday at the last minute, or cut it short and need new flights home. No one likes to think about things going wrong, but OAP travel insurance will keep you covered should the unforeseen happen. How can I get good, affordable senior travel insurance? It’s a golden age for travel for over 50s, senior citizens (pensioners) and the elderly. But many still find it hard to get cost effective travel cover as a senior citizen. You can tailor your policy to add on any extras, or to increase the level of cover, even after you’ve bought it. Get your tailored quote for senior travel insurance online here, or talk to us now on 0800 033 4902. If you have pre-existing medical conditions, you’ll need to declare and cover them on your travel insurance to be properly protected. We’ll ask you some questions in our simple, confidential screening process. Then we’ll give you an instant quote that includes your medical conditions, plus any other cover options you wish to add to your policy. Sadly, there are a few pre-existing medical conditions we can’t cover, but you’ll be encouraged to know we do cover 98% of people who contact us***. It can be a real pain if you have a travel-related problem with your trip – such as delayed luggage, loss or damage to your belongings, or flight cancellations. If you have a medical emergency while you’re away, it can be extra-stressful. You might need to find a doctor in a foreign language, or find a hospital while in a panic. Then you might need to arrange and pay for extra hotel accommodation, possibly even a new flight home for you and your travelling companion(s), having missed your original return flight due to illness. But with the right senior travel insurance policy, you can minimise or avoid all these worries, inconveniences and costs. Our Basic and Comprehensive levels of cover can be used for Single trip and Annual Multi-trip policies. For more details on the level and kinds of cover we offer, why not look at our policy documents. And please do call us on 0800 033 4902 if you still have any questions about what’s covered. We like to help. Can we buy our senior travel insurance together? another plus to buying together. If you buy together, you could be insured for costs you incur if another person on your shared policy falls ill. So for instance, what happens if you have to cut your own holiday short because that person suddenly has to be flown back? No problem – you’re covered. Get a quote online now, or call us on 0800 033 4902. What happens if I have a medical emergency while abroad? If you’ve bought an insurance policy with us and have covered any pre-existing medical conditions, then you’re covered for any medical emergency up to the level of cover you’ve bought. You can call us 24-hours a day. We have a dedicated multi-lingual team, ready to help on our medical emergency helpline if something does go wrong. We’ll also help arrange medical treatment with local doctors and provide translation services if you need it. It should be quite straightforward. If you do need to claim, you can call us and we’ll be right on hand to help. When claiming, we’ll ask you to send all of the supporting receipts and information to help process your claim quickly. If your travel plans or medical circumstances change before you go on your trip, it’s really important that you get in touch as soon as possible to tell us. Whether you have an update on your medical conditions or medication, or you’ve decided to add on something extra to your holiday, please do speak to us. We’ll do our very best to see if we can increase the coverage where necessary. If we don’t know about changes, then it may mean that we can’t cover you for a claim later on. To be on the safe side, simply talk to us about any changes. Please note: while we can increase your policy coverage, we can’t reduce coverage in return for a partial refund. So do check that you’re quite happy with the level of cover when you book. ***based on sales from 2016.